NEW YORK (FinalCall.com) - Those opposed to an Islamic center near Ground Zero garnered national news coverage and added heat to an already charged debate with a recent demonstration near the site. What was a local issue has become a nationally debated political question that has touched the president, the mayor of New York, right wing groups opposed to Islam, progressives who called for respect for freedom of religion, pollsters and has drawn international attention. About 1,000 people including construction workers, tradesmen and others voiced opposition August 22 to the Park 51 Project, which would include cultural programs and a place for Muslims to pray in lower Manhattan. Despite the troubled economy, some trade unionists said they would not take a paycheck from the Islamic center developers and would not work on the project. Speakers at the rally came from as far away as Tennessee to rail against President Obama, House Speaker Nancy Pelosi and New York Mayor Michael Bloomberg—who have expressed support for the constitutional right of Muslims to build the center. Protesters waved American flags among banners reading, “Land of The Free! Stop, Sharia Before it Stops You!” and other anti-Islam slogans. 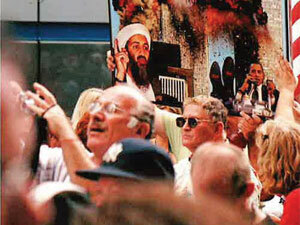 One sign depicted a collapsing and crumbling World Trade Tower engulfed in flames with President Obama and Al-Qaeda mastermind Osama Bin Laden in the background. Imam Feisal Abdul Rauf, the spiritual leader of Cordoba House, was accused of trying to establish Islamic law in New York. At the time Imam Rauf was on a U.S. State Department–sponsored trip to the Middle East to build bridges between the U.S. and Islamic world. Those who know and have worked with the imam say he is no militant, has consistently worked on interfaith dialog and promoted understanding of Islam. The so-called militant groups would like to kill Imam Rauf, they added. Opponents to the center say it would disrespect the memories of those lost during the 9/11 attacks and is insensitive. Dr. Marc Lamont Hill, of Columbia University, supports the right to build at Ground Zero. In a telephone interview, Dr. Hill told The Final Call many Americans have bought into “Muslimophobia,” an irrational fear of Muslims and Islam. Those who reject the Islamic center want to impose blame on all Muslims for an act attributed to 19 individuals, but would reject blanket responsibility of Christians for violence by Oklahoma City federal building bomber Timothy McVeigh or violence of the Christian Knights of Ku Klux Klan, whose hooded members terrorized and murdered Blacks and others, Dr. Hill said. Gov. Patterson has proposed finding an alternative site as a compromise between developers and those who don't want the Islamic center built. Mayor Bloomberg, who recently held an iftar—the meal breaking the fast during the month of Ramadan—at Gracie Mansion has repeatedly called for tolerance during this emotional debate and rejected a mosque-free zone. “The question will then become how big should the no-mosque zone around the World Trade Center be? There is already a mosque four blocks away. Should it too, be moved?” Mayor Bloomberg said, in a New York Post article. Protesters at the rally are determined to influence upcoming November elections and additional protests are scheduled, according to organizers. Officials from the New York Council on American-Islamic Relations (CAIR) said they were concerned about the rally and overall mood against Islam. A new coalition, New York Neighbors for Values, has emerged and says its mission is to promote religious tolerance.